Every being carries divinity in seed form.Human has more chances of actualizing it than other beings.Self ignorance has no beginning but there is a possibility of ending it by comprehending the self isolation process which is commonly called ego.It is an energy which creates its own limitation.Because of its activity degenerating factors are imposed on human consciousness like envy, ambition, violence,fear,greed,arrogance,possessiveness etc.They distract our perception of "what is".So with such perception action is limited because of non-understanding and so results in conflict which is quite obvious in our daily life.The implications of action born out of degenerating factors is disastrous.Unable to tolerate this life of conflict many turn to organized religions, authority, scriptures, prayers,devotion.All methods meant to free you from this process are born out of this same process, so they lead you to further ignorance, illusions, sorrow. In self-inquiry energy to this self isolation process is stopped because the whole process is under scrutiny, so it is in your hands to liberate yourself from this process.Hoping that some savior will come and save you from this process is a myth. "Me",the source of sorrow searches for peace. 'Me", the source of confusion seeks clarity. "Me", the product of self-ignorance seeks self-knowledge. When all these activities of the "me" subside in self-inquiry there is self-knowledge and thought-feeling is released from ignorance.In self-inquiry you can discover for yourself whether your action is liberating or creating further imprisonment through limitations. It is in your hands either to comprehend or increase your ignorance.In this book an attempt is made to guide truth seeker in form of quotes.They may help some genuine truth seekers. 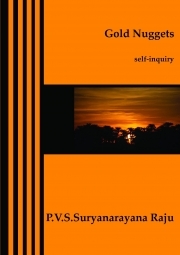 The author, Dr.PVSSuryanarayana Raju is pediatrician from Andhra Pradesh, India, born on 12th December 1950.He is working on the subject of self-inquiry for the past 30 years under the living Presence and guidance of Ramana Maharshi which he discovered 30 years A Frequent Visitor to Ramanasramam ago in RamanasramamlHe is to Greatfulness and out of Bhagawan he wrote many books analyzing his teachings and these books are some of them.His works include The Art of self-enquiry,Alpha and Omega of self-inquiry,The essence of self-inquiry part 1 & 2, Insights in self-inquiry Part 1 & 2,Theory of self-inquiry,The Practice of self-inquiry,The theory and Practice of self-inquiry,The comprehensive book on self-inquiry,,Know Thyself,self-inquiry in yoga Vasista,Self-inquiry in Adi Sankara works,he wrote self-inquiry quotes in two volumes,commented on "who am i",Upadesa saram,Akshara Mana Malai of Ramana Maharshi and all are his products of his own experience.He wrote many books on Bhagawan in Telugu which include "Nenevadanu? which is a commentary of him on "who am i" in Telugu,Nija Vicharana and his most recent books in Telugu Vichara Chudamani,and Vichara Chandrodayam mainly deal with the practical aspect of self-inquiry and he explains in them why self-inquiry is a direct and easy way for realizing the Self.He also wrote self-inquiry in Bhagavad Gita,Bhagavad Gita commentary vol1,The essence of Bhagavad Gita. Commentary on Who am i self-inquiry. by P.V.S.SURYANARAYANA RAJU.